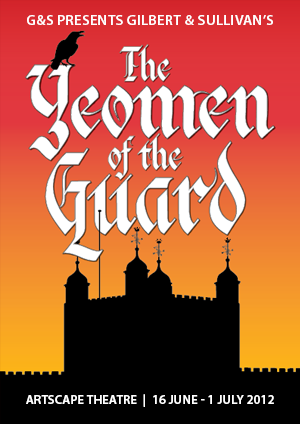 The Yeomen of the Guard; or, The Merryman and His Maid, is a Savoy Opera, with music by Arthur Sullivan and libretto by W. S. Gilbert. It premiered at the Savoy Theatre on 3 October 1888, and ran for 423 performances. This was the eleventh collaboration of fourteen between Gilbert and Sullivan. The opera is set in the Tower of London, during the 16th century, and is the darkest, and perhaps most emotionally engaging, of the Savoy Operas, ending with a broken-hearted main character and two very reluctant engagements, rather than the usual numerous marriages. The libretto does contain considerable humour, including a lot of pun-laden one-liners, but Gilbert’s trademark satire and topsy-turvy plot complications are subdued in comparison with the other Gilbert and Sullivan operas. The dialogue, though in prose, is quasi-Shakespearian, or early modern English, in style. Critics considered the score to be Sullivan’s finest, including its overture, which is in sonata form, rather than being written as a sequential potpourri of tunes from the opera, as in most of the other Gilbert and Sullivan overtures. This was the first Savoy Opera to use Sullivan’s larger orchestra, including a second bassoon and third trombone. Most of Sullivan’s subsequent operas, including those not composed with Gilbert as librettist, use this larger orchestra.